Click Here - To see how Iredell County evolved each decade - includes all the known towns and villages. Click Here - To view the significant Education events for Iredell County since the county was formed. Click Here - To see the known battles/skirmishes in Iredell County during the American Revolution. Click Here to go to the official website of the Iredell County government. Click Here to learn more about the known airports in Iredell County. Iredell County was formed in 1788 from Rowan County. James Iredell, of Edenton, NC, was one of the leaders of the state advocating the adoption of the Federal Constitution, and President George Washington appointed him a Judge on the U.S. Supreme Court in 1790. Statesville, established in 1789, has been the county seat ever since. 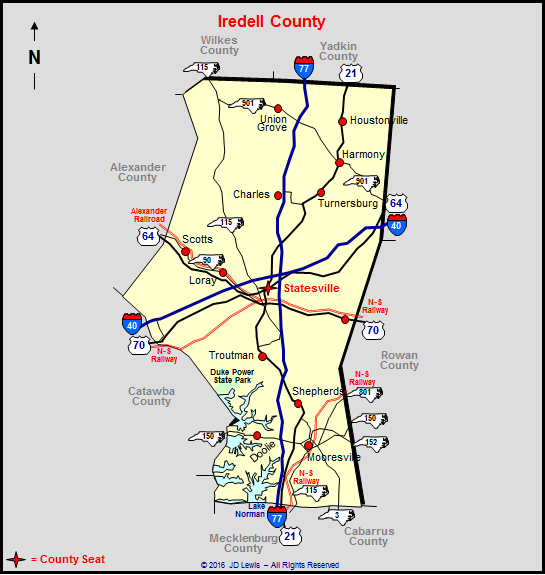 Iredell County was formed in 1788 by an Act of the North Carolina State Legislature. The county was formed out of Rowan County and was named for James Iredell who was appointed as one of the original Justices of the United States Supreme Court on February 10, 1790 by President George Washington. James Iredell was born on October 5, 1751 in Lewis, England and was the son of an English merchant. Iredell served as a North Carolina State Superior Court Justice 1777-1778 and as Attorney General of North Carolina from 1779-1781. He was appointed to the first United States Supreme Court in February of 1790 and served on the court for nine years. Ironically, Iredell never set foot in the county he is named for as he made his home in Edenton, NC. He was however pleased at having a county named after him. In a letter to his aide John Steele he wrote, Few things have happened to me with greater surprise and pleasure, I am sure, than the unexpected honor of having a new county, which has been formed out of Rowan, called by my name. He and his close friend William Richardson Davie fought for ratification of the U.S. Constitution and the founding of the University of North Carolina. Like James Iredell, William Richardson Davie would later have a county named after him when Davie County was carved out of Rowan County. Iredell and Davie County border each other standing side by side on a map just as their namesakes once stood side by side. James Iredell died on Sunday, October 20, 1799, at the age of 48, leaving a wife and family. His son James Iredell, Jr. followed in his fathers footsteps and later served as Governor of North Carolina and as a U.S. Senator. If you love horses and enjoy trail riding, this is the place for you. Love Valley, North Carolina is a horse and family-oriented camping resort town, with many miles of trails to ride varying in difficulty from wide dirt roads to steep mountain hikes, and lots of fun things to do and see. There are many great activities and events scheduled each year, but we also cater to those of you who just want to "relax and ride." There are several campgrounds to choose from ranging in amenities from 'primitive' to 'deluxe,'and a rental stable for those who don't wish to bring their own horse. There are guide services available for those of you who are 'directionally challenged.' The town of Love Valley itself resembles the set of an old western movie, complete with a general store, saloon, blacksmithy, and tack shops. Love Valley sponsors several rodeos throughout the year, and the Silver Spur has a band on Friday and Saturday nights for cowboys and cowgirls who like to 'kick up their heels' after a long day in the saddle. Mooresville, North Carolina is a thriving small town with big-town progress. Mooresville is located about thirty miles north of Charlotte near Lake Norman and in the heart of NASCAR race country. Mooresville is known as "Race City USA." Numerous race shops are located here, representing some of the hottest names on the NASCAR, Busch Grand National ARCA, and Craftsman Truck Series circuits. Each year thousands of people flock to Mooresville to catch a glimpse of their favorite driver, enjoy a museum tour and pick up a souvenir at one of the numerous shops with a racing theme. Moorseville is strategically located between racing tracks at Wilmington, Charlotte, and Darlington. Visitors can see their favorite race teams preparing for their next big event through special viewing windows in a number of shops. Troutman, North Carolina is a quaint town of just under 2,000 people located in the piedmont of North Carolina, in the southern end of Iredell County. Troutman is approximately five miles south of the city of Statesville, the Iredell county seat, and thirty miles north of Charlotte. Because of its close proximity to large urban areas, residents of Troutman are able to enjoy small-town living, and still take advantage of nearby Charlotte, which features the NFL Carolina Panthers, an NBA expansion team, NASCAR racing, and many cultural events. Lake Norman, North Carolina's largest inland lake, offers abundant water recreation opportunities only minutes from town. 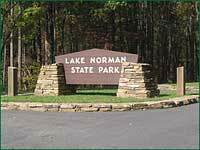 Troutman is less than two miles from the Lake Norman State Park, in the northeast corner of the lake. Union Grove, North Carolina is a small rural community located in the northern part of Iredell County, approximately twenty miles north of Statesville. Union Grove is host to the Fiddler's Grove, the oldest continuous "Ole Time Fiddlers Contest" in North America. By the middle of the eighteenth century, the struggle for power between the English and French in North America had reached a crescendo. Great Britain's colonies extended down the Atlantic Coast; French territory formed an encircling arc from Canada to the Mississippi Delta. The continuing contest for control of lands finally led to war - with the British and their Native American allies opposing the French and their Native American allies. Called the French and Indian War, the nine-year conflict began in the Ohio Valley in 1754 and spread throughout the world. The colonial General Assembly of North Carolina prepared for war, voting funds for troops and ordering the building of a fort on the western frontier. Thus, in 1756, Fort Dobbs was constructed by a company of provincial rangers commanded by Captain Hugh Waddell. The new fort was located in the piedmont region near the Blue Ridge Mountains and was named in honor of the Royal Governor Arthur Dobbs. "they . . . found it to be a good and Substantial Building of the Dimentions following (that is to say) The Oblong Square fifty three feet by forty, the Opposite Angles Twenty four feet and Twenty-two, In height Twenty four and a half feet as by the plan annexed Appears, the Thickness of the Walls which are made of Oak Logs regularly Diminished from sixteen inches Inches to Six, it contains three floors and there may be discharged from each floor at one and the same time about one hundred Musketts the same is beautifully scittuated in the fork of Fourth Creek a Branch of the Yadkin River." "We had not marched 300 yds from the fort when we were attacked by at least 60 or 70 Indians . . . We rec'd the Indian's fire: When I perceived they had almost all fired, I ordered my party to fire which We did not further than 12 Steps each loaded with a Bullet and 7 Buck shot, they had nothing to cover them as they were advancing either to tomahawk or make us prisoners . . . the Indians were soon repulsed with I am sure a considerable Loss, from what I myself saw as well as those I can confide in they cou'd not have less that 10 or 12 killed and wounded . . . On my side I had 2 Men wounded one of whom I am afraid will die as he is scalped, the other is in a way of Recovery, and one boy killed near the fort." Later, in 1761, twenty-three hundred British Regulars and Provincials soundly defeated the Cherokee; the western frontier then was pushed nearly fifty miles west of Fort Dobbs. The signing of the Treaty of Paris in 1763 ended the French and Indian War and gave the British undisputed control over North America. 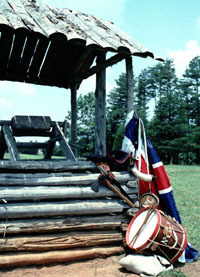 The following year, the colonial General Assembly made the decision to dismantle Fort Dobbs, as it was no longer useful; the garrison was dismissed, and supplies were removed. Consequently the buildings fell into ruin and disappeared, leaving only ground impressions. Click Here to view / download an early map of Iredell County. Click Here to view / download eight road maps of Iredell County.